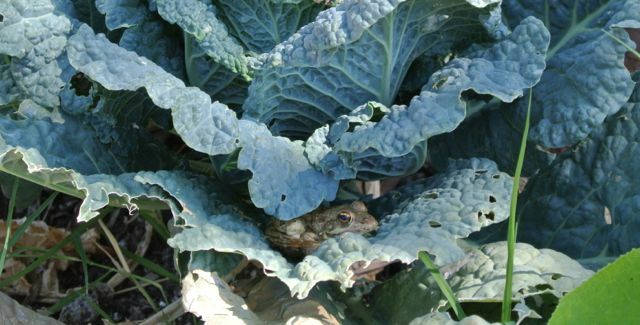 I was weeding in the keyhole beds when I noticed someone in the Savoy cabbage. Actually, I am surprised that the cabbages haven’t bolted yet in this heat, but just to be sure we’ve been eating them up. This is one of the last ones left. I’m sure this little fellow is going to miss it when we cut it! I know we’ve played Spot the Frog before, and it wasn’t so easy to see them in the pond, but this time it’s plain to see. The frogs are venturing forth from their ponds. This could be due to the amazing leap forward that the garden took in my absence. While I was in NY, I called Ali regularly with Skype. Every time I asked him what he was doing, he said, “watering.” He would then regale me with tales of how hot and dry it was, and how all the vegetables were dying. Our summers are boiling hot and bone dry, so it is a season where we scramble around for months, trying to keep things alive. Our first summer, we had no hoses, just one pipe that brought water to our garden from the water source. We watered the garden one plant at a time, with buckets, that year. By the following summer, we had hoses more or less all through the garden. So it was up at 5 to water before the sun hiked itself up over the hills at 7. We usually watered a little again in the evening as well. For me, summer was the smell of water on parched earth. When we returned from NYC, I was eager to get back to the garden, but frankly not very optimistic about what I would find there. When we pulled in through the front gate, Ali said, “Pretty dry, huh.” And it was — the weeds were their usual summer husks and the road was crunchy. But as I went down the stairs to the house, I immediately smelled a difference. It was the smell of wet earth. And when I looked under the plants I saw lengths of thin black hose culminating in green-tipped mini sprinklers. Ali had drip irrigated the entire garden, except for its very uppermost reaches. I say drip irrigated because the sprinklers drip rather than spray. We do not have much water pressure to speak of. Our water flows from an “eye” where an underground spring has welled up to the surface. One memorable summer day in 2008, we laid a thick black hose from our house to that eye, about a kilometer away. On our end of this arrangement, there is a pipe to the house and kitchen, and a faucet which we connect to a hose running into a 1.5 ton water tank. The drip irrigation runs off this, with only gravity to keep things moving. Still, gravity does a fine job of it, and now instead of waking up at 5 to wrangle hoses, we wake up at 5 to weed, harvest, tend to the chickens and the greenhouse, and watch our garden grow. This year, for the first time, it feels as if the garden might actually grow over these beastly summer months instead of being held just this side of parched oblivion. We’ll see. 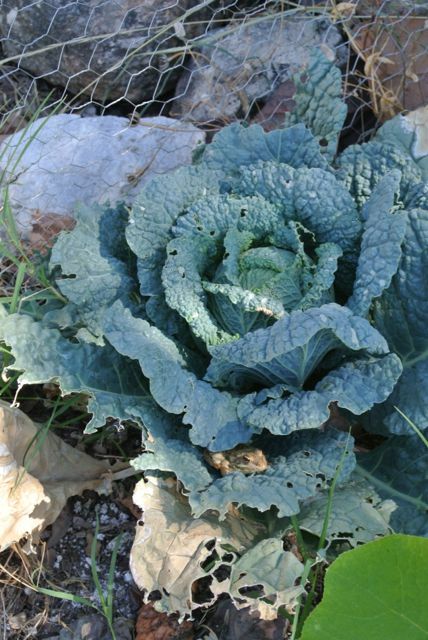 It was funny to look at a cabbage and realize that someone was looking back at me! Great pictures and story, Siobhan! Wish Ga could have seen that frog. And that’s a lot of work Ali did to lay in all that drip watering! Thanks, Uncle Wei! I bet she would have had a real chuckle over that frog — it was like something out of Beatrix Potter to find it hiding in there. I’m quite sure, by the way, that your garden was an inspiration to my drip watering dreams. Just my luck that Ali made them come true. Cool shot of the frog. Good that it stayed and posed for you. I would love to have a drip irrigation system in my garden especially this year, it has been hot and dry for weeks and more of the same to come. (gasp!) Would you like at that little fella! We also use drip irrigation. Well we do when we’re not slapped with a hosepipe ban that is. Ah, the hosepipe ban. I guess this is one advantage to not having municipal water- no one to tell you not to use it. Aw! Kermit’s Kousin! What a wonderful surprise to come home to find your garden in such good shape. Ali must’ve been hard at work while you were gone. I use a drip hose, covered in mulch, in “my girl’s” bed. It gives them a good soaking without fear getting their leaves wet. One of these days I’m going to do the same with the other flower beds. There’s always something to do, isn’t there? It’s true, there always is. I think though that this might be one of the more reassuring things about having a garden. Drip hoses certainly seem to be the answer, and so much less water is wasted as it gets to the plants more quickly and easily. Loving the frog ! I take it as a good sign that the frogs have ventured forth- surely it means that the garden is a more hospitable place than it was pre-drip!